Pictured in photo, l to r: Division VP Ken Evans, Scholarship recipient Matt Reilly, Division President Jim Miller, and Financial Secretary Garry Egan. Officers of the Father John P. Washington Division 7 of the Ancient Order of Hibernians recently presented the Patricia Keane Scholarship to a local high school student. This is the third year that the scholarship has been given to a graduating senior from a local Catholic high school who will be attending college. 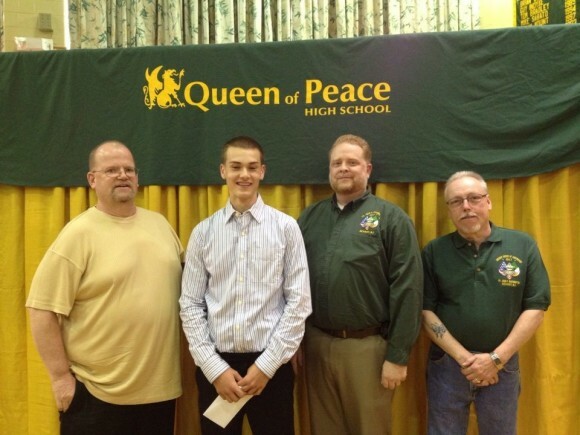 Matt Reilly of Queen of Peace High School in North Arlington, NJ was named as the 2014 recipient. His scholarship was presented at a luncheon held at the school prior to graduation ceremonies. Division 7 will also be holding a fundraiser for next year’s scholarship on July 12. A Blind Draw Doubles Dart Tournament will be held at the Donegal Saloon in Kearny to replenish the scholarship fund.